Food, Food and More Food | getWrite! You know I like to promote others first. 🙂 The Queen of Barbadian Chefs, my ‘Stepmudda’ prepared this meal for me last Sunday. I have stalked this lady in the kitchen, and yet I cannot get my rice to come out like hers. It is so frustrating! She uses onions, celery, garlic, thyme, seasoning and puts a pigtail in the boiling water, so you know this rice doesn’t even need any gravy. There are few places where people fight to eat white rice straight from de pot – de Stepmudda house is one of them. The spare ribs…lawd. It brings a tear to my eye thinking about them. They came out of the oven and the family had a moment of silence. Stepmudda makes great salads too! The woman is the Midas of food – everything she touches is golden. The potato salad is perfect; in fact, I can only eat her potato salad. That’s the downside of perfection, because everyone else’s is always lacking. I don’t even bother to try it anywhere else. A few years ago I hated all things vegetable, but a friend got me to try a black bean salad, and I enjoyed it! Afterwards I had to battle cognitive dissonance for my liking for black beans against my perception of vegetables – A battle that I have happily passed onto my little sister, who was even more adverse to veggies than I was. She came into the kitchen while I was preparing this meal and cried out “Yay! Black Beans!” and then stopped short, looking disturbed. Then she turned to me and said, “What have you done to me?” Ha! 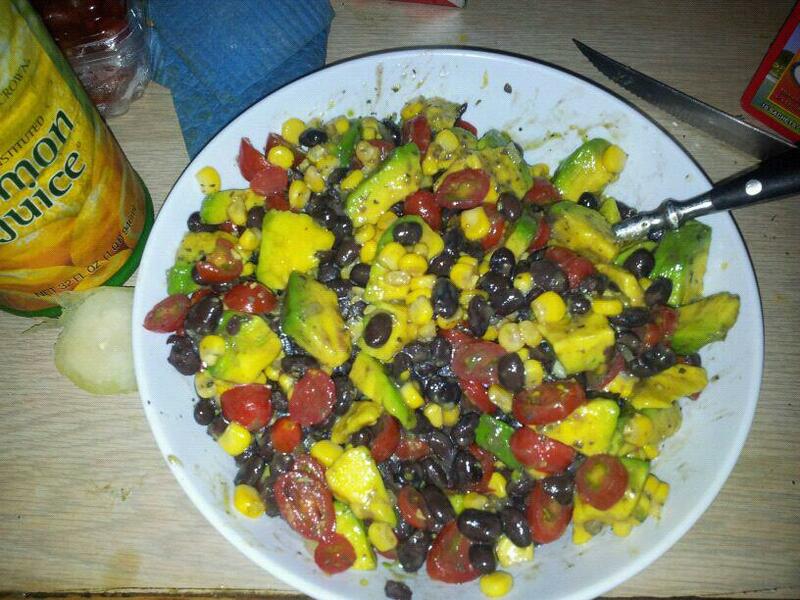 This is easy to make: black beans, corn, cherry tomatoes, green olives (some people prefer black), avocado, onion, oregano, lime juice, salt and pepper to taste. The recipe called for olive oil but I used this olive oil and vinegar mix, which tastes pretty good. It’s great to eat with tortilla chips! Due to popular demand, I have to get the recipe from her. I do know that she made the stuffing using Eclipse biscuits, and you see the green seasoning stuffed in the chicken breast? She makes that herself. I watch her chop the chives, garlic, onions, peppers and seasonings herself to make authentic Bajan seasoning. None of this bottled stuff is good enough for her. Anyway the chicken was amazing – the flesh came away from the bone with a flick of the finger, and it was juicy and delicious. We didn’t even make it to the lawn lol We stood right there in that kitchen and ate it. Lime and Salt chicken. Marinate in soy sauce, Worcester sauce and Teriyaki sauce. Cut green seasoning (bought or made) into chicken breasts and legs. Stuffing: soak Eclipse biscuits in salt water (not too soft, should be able to roll stuffing), add chives, onions, garlic, sweet pepper, thyme, celery and seasonings. Cut liver, heart and gizzard into fine pieces, add to mixture and stuff chicken. Shake all purpose seasoning (Goya) and favourite herbs (parsley/oregano) over chicken. Cover with foil and bake at 350. Right…so over to my stuff. I don’t have the golden touch, but I try. Below is one of my favourite recipes that I got from my Spanish friends while studying in Europe – Spanish Omlette aka Tortilla. It’s so easy to make; the only ingredients are eggs, potatoes, onion and salt, plus a bit of oil to fry. The hard part is flipping the omlette and maintaining that circle shape. Since I can’t flip, I wait until one side is fully cooked, cover the frying pan with a plate, turn it over, and then slide it back into the pan. It does the job. I made a small salad for the side: lettuce, cherry tomatoes, olives, mozzarella cheese sprinkled with balsamic vinegar. It didn’t come from a recipe; I had to go supermarket shopping and these ingredients were the only things left in the refrigerator. It was good though! This was my “after-gym” meal. Speaking of “After gym”, I went to the supermarket after a work out and came across “Scalloped Sweet Potatoes” in the food section. Now I had never tried it, and had to buy it, despite the ridiculously high price. I have this thing where I like to try food before I die lol Sometimes it pays off, sometimes it doesn’t. For instance, this weekend I ordered a Canoli from a restaurant, Mama Mia’s, bypassing all of the chocolate ganaches, gelato and cheesecakes, simply because I had never tried it before. It wasn’t my cup of tea (although the pizza, pasta and service at Mama Mia’s was great), and the lovely owner didn’t charge me for it when I told her I didn’t like it. Right back to my sweet potatoes. I tried to re-create the dish using two cheeses; Cheddar and Mozzarella. Ok fine…I had two cheeses in the fridge that were on the on the brink of expiration, so I had to use them. It didn’t come out as great as the one I bought from the supermarket, but it was pretty good for my first try. The highlight was the chicken! I am trying to cut flour from my diet, so I put oats in the blender, and made oat flour! I added some spices, covered the chicken in the mixture and Voila! It tasted great, and it was healthy! Will definitely be doing that again. A couple weeks ago I had this craving for burgers, but I was too lazy to get up and go buy one. So…I decided to make them myself! Now who said nothing good ever comes from being lazy? 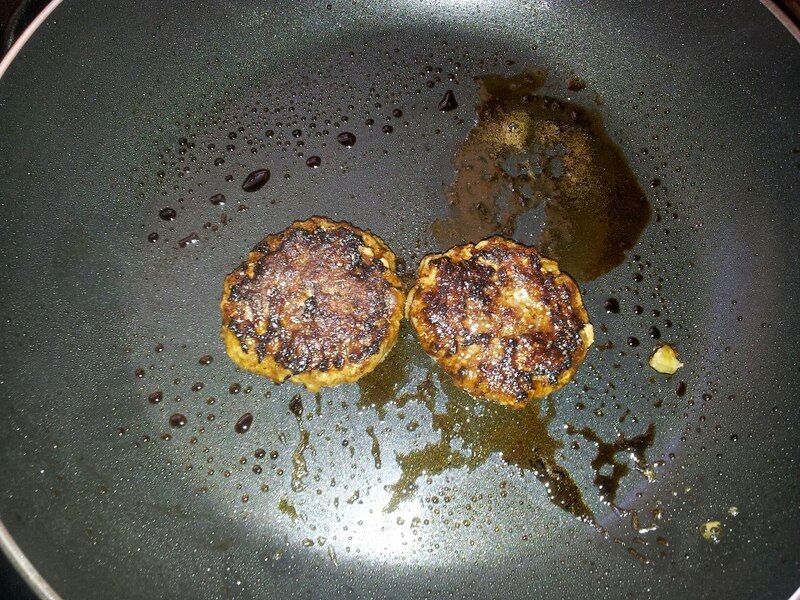 I swear, I will never buy burgers from the supermarket again! These were so good; I gave some to some family members and friends, who all requested more. I used Grade A beef, chives, onions, celery, seasonings and used a bit of the oat flour+ egg white as a binder. I want to try some different flavours this weekend: pork and apple burgers, and salmon and feta cheese burgers. I’ll let you know how they come out. This entry was posted in Latest News, Muse-ings, Shakirah Scribbles and tagged Barbados, barbecued spare ribs, black bean salad, Caribbean recipes, chicken, Food, healthy food recipes, homemade burgers, scalloped sweet potatoes, stuffing, writing by Shakirah. Bookmark the permalink. This entire blog brought tears to my eyes. Tsk tsk tsk will send healthy recipes for consideration. Send away! Since I ate the mozzarella/tomatoes/crackers and cheddar/pepper jam/crackers combos from you, they’ve become quite a staple in my diet when I want a little snack. Isn’t food ADDICTIVE to write about? With you on making your own burgers! Next time, try bread crumbs as your binding agent – much better texture. Sometimes I even put a lump of cheese in the middle and call it a “cheese bomb”. It was fun! And I have so many food pics in my phone (from home and restaurants) that I could blog daily about it. Stepmudda is a boss. That is all. 1. Shakirah has never taken me by her ‘stepmudda’ -_- That will have to be changed soon. 4. This is the longest blog that you have written. It’s no surprise it was about food, you foodie. (I don’t mean that as a curse as a foodie myself. 1. I’ll get her to prepare a meal for you when you come back to Bim. 3. I love cultural differences! To us, if it look white, it is white rice. Although she puts some seasonings in it is very subtle, so some people would still use a bit of gravy. You will see when you try some. Loved this! I’ll just have to be content with staring at the wonderful chicken on the screen and try to forget the fact that all I have with me for lunch is Heinz tomato soup… from a tube! Tragic! I really like the idea of the black bean salad too, I’ll definitely have a go at making this when the snow stops. Salad requires some sun, I feel! You will love the black bean salad. Don’t forget the tortilla chips! Oh, this has definitely inspired me! Must remind myself all that seasoning and cooking my grandmother taught me wasn’t heartless child labour after all. I just did jasmine rice with kidney beans yesterday and it was LOVELY! No it wasn’t heartless child labour at all lol Let’s put those skills to good use.